Ripudaman Malhotra, who is also co-Author of “A Cubic Mile of Oil” says, “When you consider how little time we have to act to stop ocean acidification and warming that are destroying the base of the ocean food chain, and that solar and wind energy are not ready to replace coal and ol energy sources, I suspect leaders will increasingly recognize that we need to rethink nuclear energy.” More at cmo-ripu.blogspot.com. 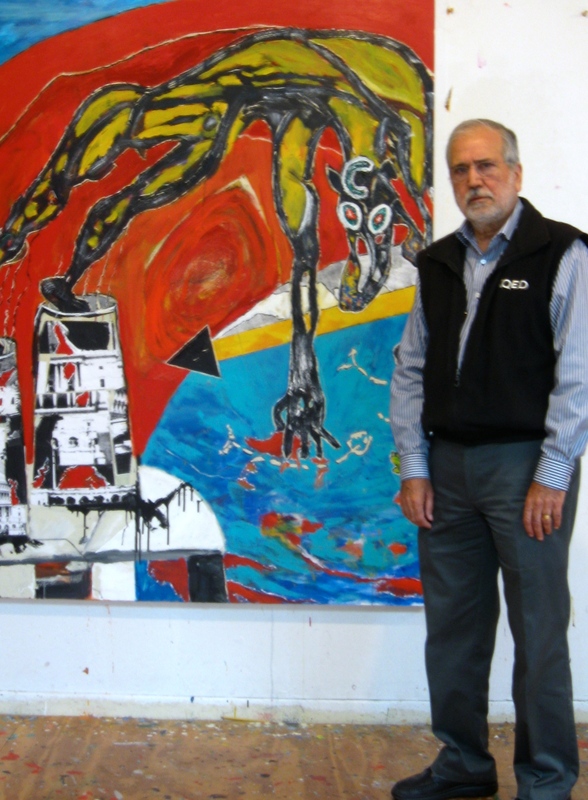 Ripudaman Malhotra next to part of Michael Killen’s ‘Don Quixote Meets Ocean Change’ (15 x 6) painting. An organization that is part of the United State Government will be first to display the painting December, 2014. Ripudaman advises Michael on energy issues. This entry was posted in Uncategorized and tagged arttist, atomic, California artist, carbon emissions, nuclear energy, nuclear SRI International, ocean acidification, ocean change, ocean warming, sustainability, US Energy. Bookmark the permalink.